I wanted table-top digital clock with BIG numbers and two alarms (first one to wake me up and second one to remind me to go to sleep) with ability to turn alarms off by tapping anywhere on the screen. Unfortunately, I did not find something I liked, so I decided to create my own. JocysCom-Clock-Program.EXE - if you want to use clock as program. JocysCom-Clock-ScreenSaver.SCR - if you want to use clock as screen saver. If you want biggest digits possible, use HOUR12 : MINUTE, H hour format and JocysComF0#_H12 fonts. • Shows date and time, set in your device's date and time settings. • Can show year, month, day, day of the week, hours (12/24) (-12...+14), minutes, seconds, timer (0-23:59), stopwatch (0-23:59). • Changeable colors (16777216) and 256 opacity levels for date, time, pattern (JocysCom fonts) and background. • Can be made fully transparent. • Two alarms and snooze-timer-stopwatch can open audio or video files (mp3, wav, wma, avi, mp4, etc..), web pages. • Alarm audio stops automatically after 10 minutes. • Snooze - Timer - Stopwatch (0-23:59). • Skip (mute) next alarm - if you are awake already or don't want alarm to play audio or video for another reason. • Tap anywhere on screen, move mouse or press any keyboard key to stop alarm audio (if alarm is set to show snooze without settings). • Can be used as screensaver. • Digitally signed, no advertisement, no banners. You can tap anywhere on screen to stop video-audio with this setting. (+) Button starts pre-set Snooze-Timer-Stopwatch. You must press “Snooze” or “Stop” button to stop audio-video. “Snooze” button starts Snooze-Timer-Stopwatch. 2018.12.16 - Timer and stopwatch pattern fixed. If hours are not set, alarm-snooze shows (HH:mm) time format in mini frame. 2018.03.01 - Mouse pointer becomes visible instantly when snooze panel opens. 2018.02.28 - Snooze panel show up and and auto-hide bug fixed. 2018.02.25 - Alarm can open web pages (video, audio). 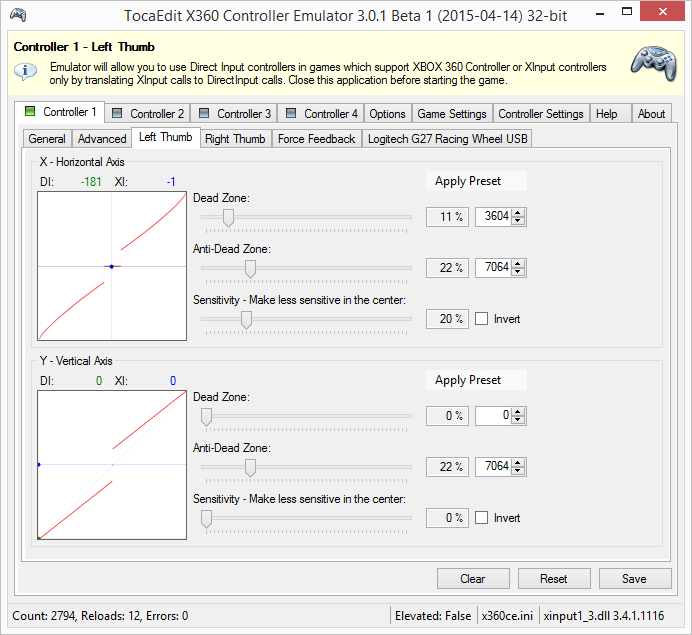 Various margin settings added. Line 1 and 2 fonts and sizes can be different. 2017.12.10 - Doesn’t save position and size, when snooze settings are open. Browse file window menus don’t disappear each second. 2017.12.06 - Snooze-Timer-Stopwatch window with settings now minimizes time window, instead of covering it. 2017.12.05 - Snooze-Timer-Stopwatch code updated. Timer doesn't start, if past time is set (before Timer starting time). 2017.12.03 - EXE and SCR files signed and RTF file cleared from word processor scripts (can be opened without warnings). 2017.12.02 - Snooze audio, starting at the same time next day, bug fixed. 2017.12.01 - Alarm sound 2 fixed (all 3 beeps audible). Snooze window and buttons hide automatically, when snooze sound-video ends. SIMPLIFIED and OLD version of “Jocys.com Clock for WINDOWS COMPUTER”. • Can show year, month, day, day of the week, hours (24h mode only), minutes, seconds. • Changeable colors (16777216) and 256 opacity levels for date, time, pattern, background. • Two alarms. On “Loop” audio plays for 5 minutes. • Tap on screen, move mouse or press any keyboard key to stop alarm audio. • No advertisement, no banners. Reads quests and chat messages with text-to-speech voices. Makes game more immersive and you will not miss messages in chat. If “Monitor” doesn't work, you may need to disable IPv6 in WoW game. Read... Problems and Solutions. When you open window with text (dialogue, quest, book, etc.) or receive chat message in game, WoW “Addon” creates and sends message to you between <message><part>text</part></message> tags. This message can include text, name, gender, effect, group, pitch, rate, volume, etc. and command value. Then, “Monitor”, which must be running in background, while gaming, picks-up this message from your local network traffic, converts it to SAPI XML and reads it with specific text-to-speech voice. To move mini frame with [≡][■] buttons: Move mouse pointer over [■] button. 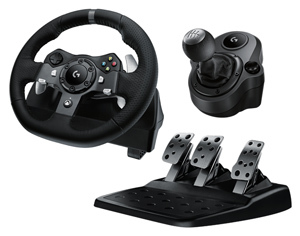 [≡] (Options) button will appear. Click on [≡] (Options) button, to open “Options” window. Unlock mini frame by unchecking first check-box in “Options” window. You can move “Options” window out of the way, if it is on top of mini frame with [≡][■] buttons. Move mini frame by clicking on black background around [≡][■] buttons. Lock it again, by checking the same check-box. You can create your own text-to-speech addon (if game supports addons) or send messages directly to “Monitor” from your own game, to add text-to-speech feature to the game. We don't mind if code from our WoW Addon will be used to add text-to-speech features to other addons. How and what messages to send with SendAddonMessage(...) in WoW, so “Monitor” could see them, can be founded in our addon's lua file. These messages can be visible in chat window, if check-box “Hide addon <messages> in chat window” is unchecked in our addon's “Options” window. Messages are also visible in “Options” window itself and in “Monitor”'s [1. Incoming Messages] tab. If other addon will take over one of the text categories, this category can be disabled in our addon, by unchecking corresponding check-box, to avoid text-to-speech duplication. There is also help about <messages> with examples in “Monitor”'s [Help] tab or JocysCom.TextToSpeech.Monitor.rtf document • Tested on Windows 8 and 10. FREE text-to-speech voices can be installed with Microsoft language packs. BETTER text-to-speech voices are developed by Ivona and distributed by Harpo Software. Security and concerns • Why it is not on Curse? It is not on Curse, because of “Monitor”, which is external program. Blizzard has no control outside the game over “Monitor” and, reasonably, can't take responsibility for it, by allowing it on Curse. Therefore, we keep everything as transparent, as possible. This project is open source and anyone can check all code at any time. We digitally sign our software and put our real names on it, so everyone could know, who to blame, if something will go wrong. “Monitor” and “WoW Addon” does not give you more power over NPCs or other players in game. It does not send data back to game or anywhere else. It only reads local network messages between <message> tags or text from your clipboard with installed text-to-speech voices, when you want it. It makes game more involving, fun and interesting (especially for those people, who played WoW from the first day, it was released… like us. It became slightly boring to read all quests after some time). Also, it makes game easier for people with dyslexia or visual impairments. We are grateful, that gods from Pantheon of Blizzard are merciful enough not to block “WoW Addon” and let people use it :). Please download this “WoW Addon” and “Monitor” only from trustworthy sources. Make sure that “Monitor” is always signed by verified publisher with signature, issued by trusted certificate authority. Installation • Exit WoW before installing or updating addon. 2. Open “File Explorer” (Win+E). Locate downloaded file and open it. 3. 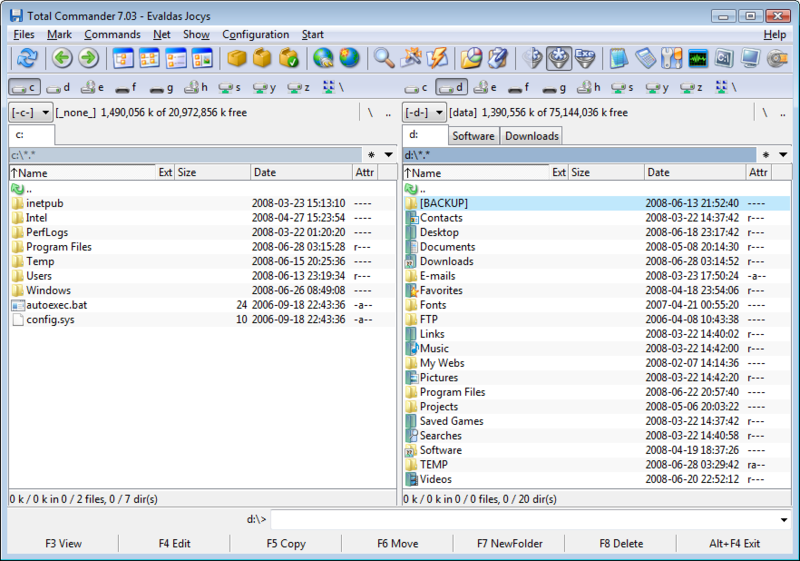 Copy JocysCom-TextToSpeech-WoW folder ( folder is inside downloaded zip file ). 4. 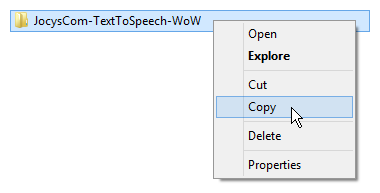 Paste JocysCom-TextToSpeech-WoW folder inside “AddOns” folder of WoW. 5. Install additional text-to-speech voices, if needed. FREE text-to-speech voices can be installed (on Win 8.#) with Microsoft language packs. 1. 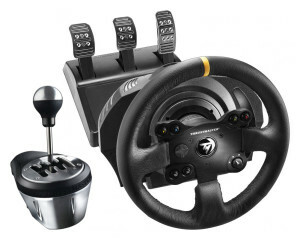 Right-click the “Start Button” > Control Panel > Language. 2. Add additional languages like English (United States) or English (United Kingdom), etc. 3. Go to “Options” of each language and click on... [ Download and install language pack ]. Not all languages have text-to-speech voices. To switch between languages in Windows ( Win+Space ). • English (United States) - David (male), Zira (female). • English (United Kingdom) - Heera (female), Hazel (female), Zira (female). • Chinese Simplified - Hanhan, Huihui. • Chinese Traditional - Tracy. • Spanish - Helena, Sabina. BETTER text-to-speech voices are developed by Ivona and distributed (~$45 each) by Harpo Software. Download and test voices 30 days for free from distributor Harpo Software. Good Ivona voices are English-British “Amy” and “Brian”. Some other voices are not bad too. If you know free of charge text-to-speech voices as good, as voices by Ivona, please, write us or leave comment about that in comment section. When you will run JocysCom.TextToSpeech.Monitor.exe, additional text-to-speech voices should be visible now. 6. Run JocysCom.TextToSpeech.Monitor.exe ( file is inside pasted folder ). You can pin “Monitor” to Windows OS taskbar, if you plan to use it frequently. Administrator rights are required to run this program. Make sure that you are using digitally signed software. Digitally signed software ensures that users can verify origin of software and that no one has tampered with it. Any modification in code of software, after it is signed, invalidates digital signature. 7. User Account Control window must show “Verified Publisher: Jocys.com” or “Verified Publisher: Evaldas Jocys”. Do not trust executables from “Publisher: Unknown”. 8. Click [ Yes ] button. If you get DirectX error (after trying to run “Monitor”) or no sound, proceed to parts "3" and "4". Turn Windows features on or off > enable “.NET Framework 3.5 (includes 2.0 and 3.0)”. “Monitor Clipboard” option doesn't work and must be [Disabled] in Windows XP. “Addon” requires latest version of “World of Warcraft” game. 9. When “Monitor” will open, setup voices in [ Voices ] tab (example). “IVONA 2 Brian” -- will be used as Male (100) and Neutral (100) voice. “IVONA 2 Amy” -- will be used as Female (100) voice. “Microsoft Hazel Desktop” -- will be used as Neutral (50) voice. Number ( from 0 to 100 ) sets, how often voice should be used, relatively to other voices in the same category (Male, Female or Neutral). If you have IVONA male and female voices, you can disable “Microsoft (...) Desktop” voices ( as they are quite bad ). Monitor can't play voices, if their trial period is expired. You can test, which ones are expired, by enabling one voice at a time and pressing [ Speak ] button in Monitor. Such voices must be disabled in [ Voices ] tab. Speed of voices can be adjusted in “Monitor's” “Rate” fields. Values can be from “-10” (very slow) to “10” (very fast). Default value is “2”. You can select “1” or “0” in both fields to make voices slower. 10. Run “World of Warcraft” game. 11. [■] (Stop text-to-speech) button will appear at the center of the screen. If you will move mouse pointer over[■] button, [≡] (Options) button will appear. If you will move mouse pointer over [≡] button, menu with various check-boxes will appear. Move mouse pointer over any check-box and title will show, what it enables/disables. To move mini frame with [≡][■] buttons: Move mouse pointer over [■] button. [≡] (Options) button will appear. Click on [≡] (Options) button, to open “Options” window. Unlock mini frame by unchecking first check-box in “Options” window. You can move “Options” window out of the way, if it is on top of mini frame with [≡][■] buttons. Move mini frame, wherever you like. Lock it again, by checking the same check-box. 12. [■] (Stop) and [►] (Play) buttons will appear at the bottom of some windows too. You can delete these files to reset settings or clear saved NPCs (game must be closed). 2. Enter macro name (for example: “Stop TTS”). 3. Choose an icon for macro. 4. Click [ Okay ] button. 6. Click [ Save ] button. 7. Drag “Stop TTS” macro icon from “General Macros” tab on “Action Bar” button. 8. Click [ Exit ] button. 10. Bind desired keyboard key to "Action Bar" button with “Stop TTS” macro. After pressing this key on keyboard, text-to-speech will stop. 1. WoW Main Menu > System > Network > Uncheck (disable) “[ ] Enable IPv6 when available” check-box. 1. Close WoW game and “Monitor”. 2. Click [Win]+[X] keyboard keys together. 3. 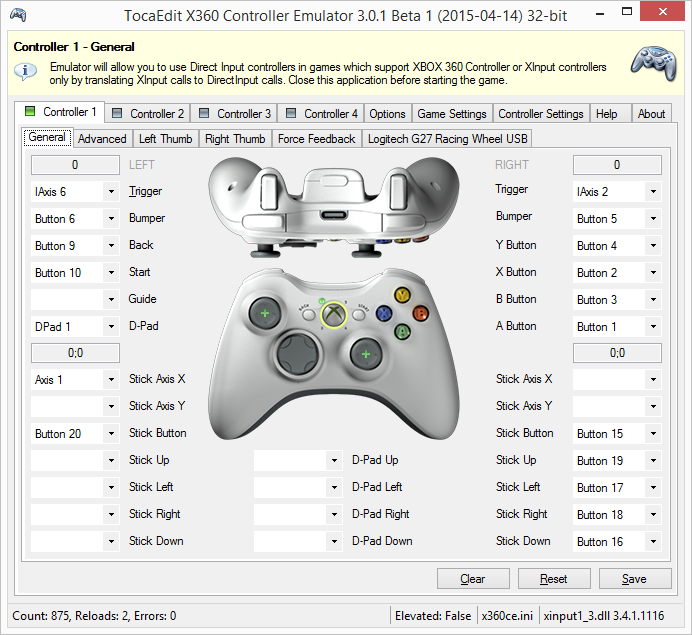 Select “Control Panel” from menu. 4. Select “Small icons” in “View by:” drop-down menu. 5. Find and select “Network and Sharing Centre”. 6. Click on “Change adapter settings”. 7. Click with second mouse button on network card, you are using. 8. Select “Properties” from menu. 9. 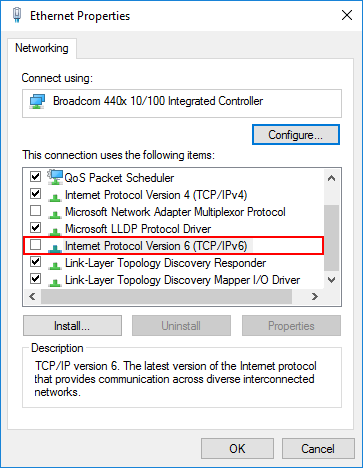 Uncheck (disable) “Internet Protocol Version 6”. 10. Click [ OK ] button. 11. Run WoW game and “Monitor”. Don't forget to enable (check) “Internet Protocol Version 6” again later. If your computer is slow, you can use “Monitor's” “Cache Options” to write and read audio files. The next time, when you will encounter the same dialogue-text, “Monitor” will not use TTS voices and will not create audio file again, but will play instantly previously created audio file instead. If you put custom recorded MP3 file with the same name then "Monitor" will play MP3 file, instead of WAV. • Getting UnitSex of NPC from chat and quest log -- no need to select it to get gender. • Getting UnitAge of NPC (%) -- (1-100) in order to apply “Child", “Adult” or “Senior” effects. • Getting UnitRace of NPC -- Sound effects on NPCs are applied by UnitCreatureType now. • Getting value if NPC has voice over for all text -- in order not to start TTS speech. • NPC “talking” animation should loop, depending on length of the text. 2.6.16 (2018-11-10) -- "Voice" column added and "ON" column works now in [Voice Defaults] tab. [Update] tab fixed. 2.6.13 (2018-07-29) -- Updated custom audio file recording and reading settings. Added MP3 support. 2.6.7 (2018-07-27) -- Updated Audio Player. Fixed playback on non-default playback devices. 2.5.9 (2018-05-15) -- Fixed XAudio2 problem on Windows 8+. 2.5.7 (2018-05-14) -- Intro sounds crashing "Monitor" problem fixed. 2.5.6 (2018-05-12) -- [Options] tab > "Output Device:" drop-down added. Now you can select output device for audio. 2.4.22 (2018-01-22) -- Search now includes "Group" column in [Acronyms] tab. 2.4.21 (2018-01-22) -- [Select All], [Deselect All], [Check Selected], [Uncheck Selected] buttons added in [Acronyms] tab. 2.4.20 (2017-12-01) -- "Cache TTS audio" option added in [Options] tab to save CPU resources. 2.4.18 (2016-12-20) -- Acronym "be" > "blood elf" disabled by default. 2.4.18 (2016-12-14) -- Fixed: "Radio" sound, [Acronyms] "ON" checkbox, "Sequence" and "Size" values. 2.4.8 (2016-12-14) -- Tab for acronym replacements, like "brb" > "be right back", added. 2.4.7 (2016-11-15) -- WinPcap option disabled if not installed. Other WinPcap related updates. 2.4.6 (2016-11-15) -- TCP/IPv6 support added. Voice "overrides" updated to "defaults". 2.3.3 (2018-09-24) -- Fixed (401) MSG_RAID > CHAT_MSG_RAID, (422) MSG_INSTANCE > CHAT_MSG_INSTANCE_CHAT. 2.3.2 (2018-07-29) -- "Addon" sends character's Name, custom-tts Name and Class for added Cache Options in "Monitor". 2.3.1 (2018-07-27) -- Check-boxes added: "PartyLeader", "GuildLeader"(Officers). "Battleground" removed. 2.3.0 (2018-05-11) -- Version updated for WOW 8.0.1 ("Battle for Azeroth"). 2.2.96 (2017-12-02) -- Code related to Battle.net chat messages (whispers) updated. 2.2.95 (2017-11-30) -- Version updated for WOW 7.3.2 -- [■] Button works again. Code line 397 updated. 2.2.90 (2017-04-03) -- Version updated for WOW 7.2.0. 2.2.88 (2016-12-18) -- Mini frame [≡][■] assigned to "UIParent" frame - visible with addons like "elvui". 2.2.88 (2016-12-18) -- After update, mini frame [≡][■] can appear at the center of the screen. 2.2.88 (2016-12-18) -- Click on [≡] button to open "Options". Unlock this mini frame [≡][■] and move. 2.2.86 (2016-12-14) -- "<OnEnter>JocysCom_SaveButton:Show();</OnEnter>" disabled. 2.2.85 (2016-11-15) -- Replace function updated. 2.2.82 (2016-11-10) -- Replaces text "|#-#(Race/Class)" with "Race/Class" for "Monitor". 2.2.80 (2016-11-04) -- WoW Macro / Saving NPC in "Monitor" related updates. 2.2.78 (2016-11-01) -- TTS macro fixed - ";" symbol removed from macro. 2.2.76 (2016-10-30) -- Menu with checkboxes moved closer to options [≡] button. 2.2.75 (2016-10-30) -- Problem with addon message exeeding 254 character limit fixed. 2.2.72 (2016-10-29) -- Addon sends addon messages instead of whispers + other updates. 2.2.71 (2016-10-27) -- For WOW 7.1 + macro for targeting and saving gender with type added. 2.2.50 (2015-12-01) -- "(Intro)Sound: and "Name(says):" check-boxes for "Quest" group added. 32-bit version is for 32-bit games and 64-bit version is for 64-bit games. Latest version works with “Grand Theft Auto V”. 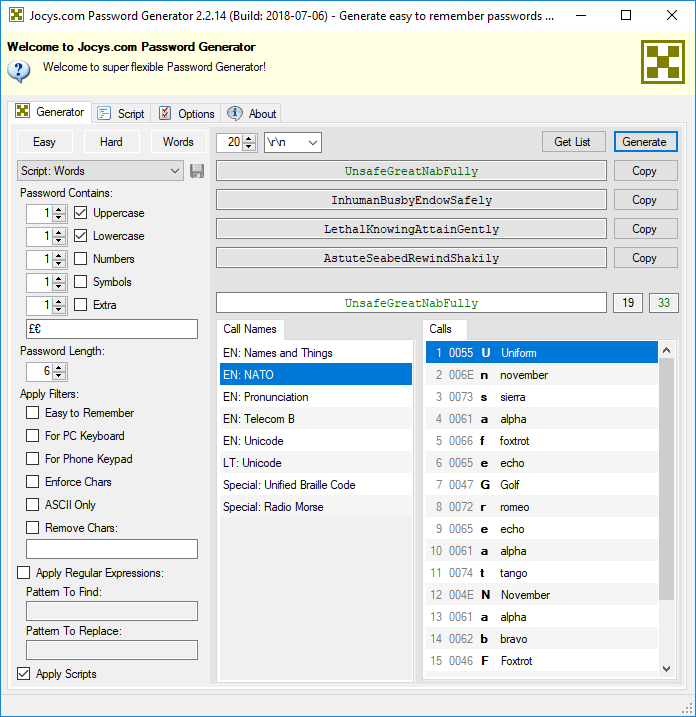 Generates easy to remember passwords which look like real words but they are not. It is much easier for brain to remember them as whole words and not as separate sequence of random chars. 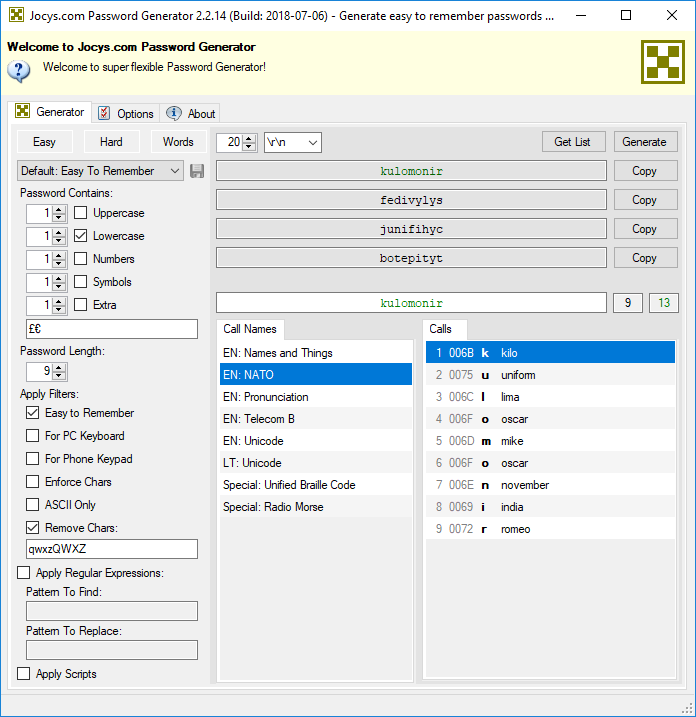 “Calls” feature converts any password or text into phonetic alphabets: NATO (Alpha, Bravo, Charlie...), Names And Things, Pronunciation, Telecom B, Unicode or Braille Code and Radio Morse, so it will be easy to pass them correctly through phone or radio conversation. The application allows you to apply regular expressions and scripts like JScript, C# and VB.NET. Jocys.com Web Screen Saver allows you to use Internet web pages as Windows screen saver. 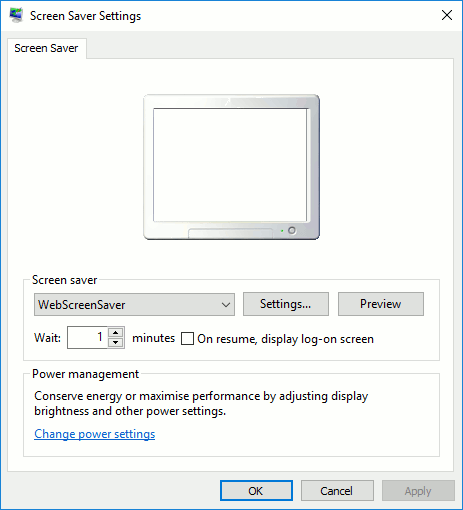 You can protect your computer by enabling screen saver locking feature in Windows Screen Saver Settings. 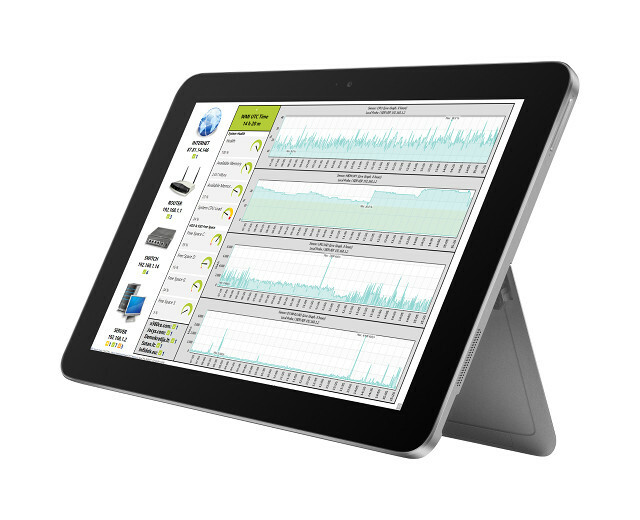 For example, you can use it on tablet with “Paessler PRTG Network Monitoring Software”. Screen saver tested on Windows 10 only. 1. Download “WebScreenSaver.scr” file and save it in permanent folder. 2. Right-click on “WebScreenSaver.scr” file and select "Install" menu option. 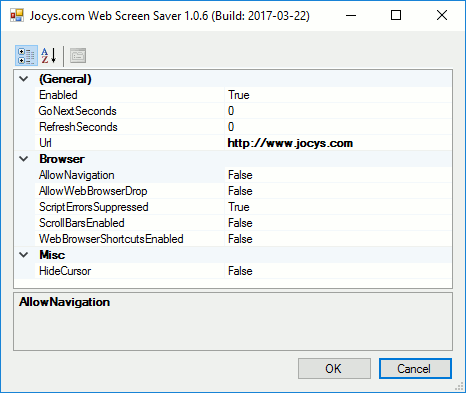 Right-click on “WebScreenSaver.scr” file and select “Configure” menu option. 1. Start > Settings > Personalisation > Lock Screen > Screen Saver Settings. 2. 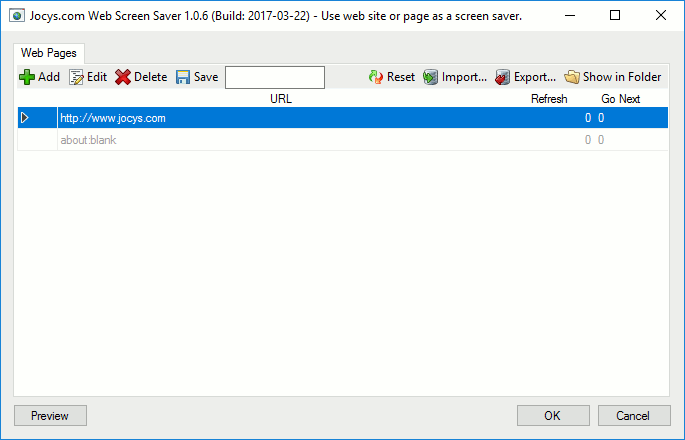 Select “WebScreenSaver” from “Screen saver” drop-down menu. 3. Click on [ Settings… ] button. UNIVERSAL APP • For Windows 10 PC, phone or tablet. FOR DESKTOP • For Windows 10 or older PC operating system. White screen light for devices without light. No banners or advertisement. Tap on ( X ) button in the center of the screen... to exit application. %COMMANDER_PATH% - Path where you have installed “Total Commander”. Done. Now your “Total Commanded” must look awesome :). Lithuanian - Lithuanian letters instead of numbers for US keyboards. Lithuanian (United Kingdom) - Lithuanian letters instead of numbers for UK keyboards. Lithuanian (France) - Lithuanian letters instead of numbers for French keyboards. Russian (Phonetic) - Russian letters under English phonetic equivalents for US keyboards (C=Ц, D=Д, F=Ф, etc.). Russian (United Kingdom, Phonetic) - Russian (Phonetic) for UK keyboards. Russian (United Kingdom, Mnemonic) - Russian (Mnemonic) for UK keyboards. You can use [right-ALT] keyboard key to reach special symbols or symbols under national letters. For example, to write email symbol (@), press at same time [right-ALT]+[SHIFT]+[@] and to write divide symbol (÷), press at the same time [right-ALT]+[d]. Optionally you can click on [Advanced Key Settings] tab, select Action “Between Input Languages”, click [Change Key Sequence...] button so you can switch between keyboard layouts with keys SHIFT+CTRL or SHIFT+ALT (depends on configuration). You can use same instruction for other keyboard layouts. Press [OK] button, press [OK] button. Now you can switch between keyboard layouts with keys SHIFT+CTRL or SHIFT+ALT (depends on configuration). Lithuanian - lietuviškos raidės vietoje skaičių JAV klaviatūroms. Lithuanian (United Kingdom) - lietuviškos raidės vietoje skaičių JK klaviatūroms. Lithuanian (France) - lietuviškos raidės vietoje skaičių prancūziškoms klaviatūroms. Russian (Phonetic) - Rusiškos raidės po lotynišku fonetiniu ekvivalentu JAV klaviatūroms (C=Ц, D=Д, F=Ф, ir pan.). Russian (United Kingdom, Phonetic) - Russian (Phonetic) JK klaviatūroms. Russian (United Kingdom, Mnemonic) - Russian (Mnemonic) JK klaviatūroms. Galite naudoti [right-ALT] klaviatūros klavišą, kad pasiekti specialius simbolius arba simbolius po nacionalinėmis raidėmis. Pvz., kad parašyti pašto simbolį (@), paspauskite tuo pat metu [right-ALT]+[SHIFT]+[@], o kad parašyti dalybos simbolį (÷), paspauskite tuo pat metu [right-ALT]+[d]. Jeigu pas jus Windows Vista ir įjungta „User Account Control“ opcija, tai operacinė sistema išmes pranešimą, kurio metu paprašys leidimo instaliuoti klaviatūras. Tokiu atveju atsakykite „Allow“ - leisti. Šioje vietoje galite paspausti [Advanced Key Settings] lapą, pasirinkti Action „Between Input Languages“, paspausti [Change Key Sequence...] mygtuką ir pasirinkti klavišų kombinaciją, kurią norite naudoti persijungimui tarp klaviatūrų, pvz. : SHIFT+CTRL arba SHIFT+ALT (priklausmai nuo konfigūracijos). Atsisiųskite ir paleiskite AdvKbd-x86.msi (32-bit) arba AdvKbd-x64.msi (64-bit). Paspauskite [OK] mygtuką, paspauskite [OK] mygtuką. Naudokite tą pačia instrukciją tam, kad pridėti kitus klaviatūrų išdėstymus. Dabar jau galite persijungti tarp klaviatūrų su SHIFT+CTRL arba SHIFT+ALT (priklausomai nuo to, kaip sukonfigūruota).